A very interesting book by Raymond Barfield was published last year by the University of Cambridge Press titled The Ancient Quarrel between Philosophy and Poetry. The book was positively reviewed. What attracted my attention was the fact that a whole of chapter six was devoted to Vico’s New Science. It follows a treatment of Plato’s and Aristotle’s views on the subject, then St. Augustine’s neo-Platonic Christian view placing revelation above both poetry and philosophy, a position modified by Thomas Aquinas’s understanding of beauty related to a more positive account of poetry, albeit one which keeps poetry subordinate to philosophy and revelation. Barfield gives particular importance to Aquinas refusal to write after 1273. He interprets Aquinas’ silence as he did Plato’s Seventh Letter, concluding that for both thinkers there exist some mysteries or experiences that exceed our capacity to articulate them. The same point is made in Dante’s Paradiso where Dante seems to be struggling to articulate the experience of the transcendent revealed realities he encounters. In chapter six, Barfield examines Vico’s New Science, in which poetry and myth are the equivalent of divine revelation. It is only when philosophy arrives that humans move from imaginative universal accounts to an intelligible universal one. But this substitution is not one of progress, because philosophy in turn becomes a type of ironic poetry and a new myth is needed to replace it. For Vico, this cycle between poetry and philosophy is interrupted with the historically true myth of Christ’s Incarnation. With this new historical event, the philosopher’s consolation resides not in the hope of earthly wisdom but in the recognition of divine providence, something larger than either the poet or the philosopher. It is divine providence that enables us to move from poetry to philosophy and then from philosophy to the irony and paradox of which the philosopher can be aware. Croce disregarded the concept of providence in Vico, but it remains central to the proper understanding and interpretation of the New Science. Thus from the very first page of the work, Vico casts Homer at us as a figure of primacy tied to an antiquissima sapientia, but one now seen in a new light as a primitive “poetic wisdom” that characterizes the first age of the gentile world (the Hebrews’ world of revealed truth is a different matter). Two features of prime importance are 1) the association of this early wisdom with the childhood of the human race, and 2) that the understanding of this age is shaped by the conditions of embodiment (since the first peoples erano quasi tutti corpo e quasi niuna riflessione (NS, par. 819) and what is directly experienced, grows directly from innate imitative capacities, and is powerfully informed by the imagination and the passions. On the one hand, this means that the prior stage of civilization must be understood in its own terms—and here Vico parts company with those learned allegorists who remake heroic poetry in their own philosophical image. But on the other hand, it is clear that, just as childhood is very different from adulthood, the experiences of the former are foundational to the latter. Hence while Vico edges toward a certain historicism in approach, at the same time he holds to the notion that there is a common link between human societies that his new science will trace. Among the axioms or degnitá of his first book, is the apodictic assertion that “There must in the nature of human institutions be a mental language common to all nations, which uniformly grasps the substance of things feasible in human social life and expresses it with as many diverse modifications as these same things may have diverse aspects” (SN, par. 161). He goes on to assert “This common mental language is proper to our Science, by whose light linguistic scholars will be enabled to construct a mental vocabulary common to all the various articulate languages living and dead” (SN, par. 162). Moreover, Vico has discovered a vital central fact: “the first gentile peoples, by a demonstrated necessity of nature, were poets who spoke in poetic characters,” an insight that empowers his broad reading of mythology and constitutes the “master key” of his new science (la chiave maestra di questa scienza (NS, par. 34). Though Vico seeks commonalities that link the disparate civilizations of history together into a total picture, it is the essential difference of the primitive age he first explicates in other degnitá stated at the outset of this study. A number of them essentially sketch the nature of early humanity. Men are naturally impelled to preserve the memories of their laws and institutions (NS, par. 201)—hence poetry is very early linked to memory and historical consciousness. All barbarian histories have fabulous beginnings (NS, par. 202); the human mind is naturally impelled to take delight in uniformity (NS, par. 204)—which is responsible for the narrativizing of disparate facts and events into coherent stories. Children naturally filter all subsequent experience through the ideas and names of the first people and things they encounter (NS, par. 206)—meaning that the tendency to unify things in the form of poetic characters is tantamount to a primitive scheme of classification. In children, memory is extremely vigorous (vigorosissima), hence their fantasy is vivid to excess (vivida all’eccesso), since imagination is nothing other than expanded or compounded memory (NS, par. 211)—this explains the vigorous expressiveness of the poetic images to be found in the primitive age, what Vico calls deliberately il primo mondo fanciullo. And finally, children excel in imitation and regularly amuse themselves by imitating whatever they apprehend (NS, par. 215), which “demonstrates” that the primitive world was one of poetic nations, since poetry is nothing but imitation (“Questa degnitá dimostra che ‘l mondo fanciullo fu di nazioni poetiche, non essendo altro la poesia che imitazione”). What is apparent here is that primitive poetry represents a social condition of knowledge, or what we today would term a “mentality” or episteme, that hangs between human ignorance and human knowing, in conformity with the very first axioms of the book: “Because of the indefinite nature of the human mind, wherever it is lost in ignorance man makes himself the measure of all things” (NS, par. 120), and “whenever men can form no idea of distant and unknown things, they judge them by what is familiar and at hand” (NS, par. 122). Perhaps the most startling feature of Vico’s historical anthropology is his highly active and creative view of memory: “Memory thus has three aspects: memory when it remembers things, imagination when it alters or imitates them, and invention when it gives them a new turn or puts them into proper arrangement and relationship. For these reasons the theological poets called Memory the mother of the Muses” (NS, par. 819). Thus the poetry of the heroic age is defined as a kind of creative memory—a record of the past, to be sure, one that is universally practiced by all the fanciulli delle nazioni, but one that also implies a constant degree of imaginative distortion. This is particularly important in reference to the anthropomorphism in Greek mythology that generates the age-old negativity of Homeric religion. It is no surprise, then, to find that the third book on Homer is in fact a work of historical recovery, as its title states: Della discoverta del vero Omero. Students of the infamous “Homeric question” are of course familiar with Vico’s surprising anticipation of the issue of collective authorship, of his synthetic characterization of Homer neither as a pure fiction nor an identifiable individual, but rather as “an idea or a heroic character of Grecian men insofar as they told their histories in song” (NS, par. 873). “Homer” is for Vico the name of a textual process. The Greeks themselves were this “Homer” (essi popoli greci furono quest’Omero, par. 875). Vico was avidly read by Marx for his attention to the origins of class struggle, and Livy figures prominently in his understanding of the evolution of conflict between patricians and plebeians—though Vico makes this a general condition of developing nations and not just the particular trajectory of Roman social history. 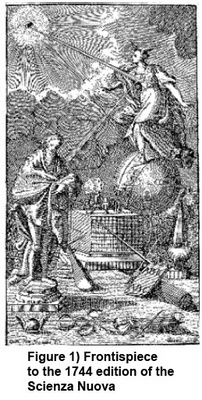 Vico’s work is indeed a sterling example of how Homer becomes implicated in a totalizing project of historical understanding, one that departs from the epistemological advantage of modernity (the “new science” of Descartes and Galileo) yet relies heavily on a particular deployment of the past. The past is not self-evident; as embodied in the Homeric text, it is authoritative yet mystified, lapidary yet in need of decipherment. But when properly decoded, Homer divulges primeval truths that modernity must listen to in order to overcome its own historical alienation and be present to itself as a human (and humane) totality. There is an element of nostalgia in Vico for the brave old world of sublime imagination, one that serves as a means of delivering a critique of modern reason. But he insists that such world is lost to the rational age, though it continues to serve as its foundation. Modern man forgets that original foundation at its own risk. The risk consists in accepting a deterministic scheme of history as inevitable progress, a la Hegel. However, given Vico’s cyclical view of history, the ages of the gods and heroes will cycle round again in the ricorso of the nations, hence there remains the possibility of regression to the mondo fanciullo—paradoxically, it is that return to origins that implies real progress in an age of overationalism where what should never have been rationalized has been rationalized…, and this is one of the free unearned gifts of Divine Providence to humankind as Vico describes it. Historicism stipulates that value is relative to "History" (or the consummation thereof). Vico does not. He finds no difficulty in calling certain mores simply barbaric. Accordingly, he critiques attempts to justify barbarism by appealing either to some hidden past (neo-Platonists) or to some hidden future (Christians). The above comment proves the point I made at the beginning of these reflections, if one was indeed needed. It is an argument made by Straussians in general: first you confuse historicism with relativism, then you call what came before in history (such as the poetic and the Homeric approach as recounted by Vico) barbaric and then you assert the supremacy of pure rationalism divorced from the poetical or perhaps absurdly blame translations of Vico for introducing an historicist Vico...as I have examined elsewhere in Ovi. Vico, in fact, calls the extreme rationalism of the third rational era, the third cycle or ricorso, the cyvle of men with fully developed reason “the barbarism of the intellect” which is to say a barbarism that can occurr in that era and that is much worse than the physical barbarism of primitive man. All one has to do is think of the Holocaust which renders its perpetrators barbarians of the worst kind and makes primitive man look like a saint in comparison. Straussians, such as the above interlocutor who never misses an oppurtinity to debunk historicism and misinterpret and distort Vico's philosophy, have still to grasp a simple principle of historicism; and that is that man is not an angel or a god living outside of time and space on Mount Olympus; he is a creature within history who builds his civilization and his culture withing history, or better, as Vico, the father of modern historicism, has well taught us, man is his own history and while the proposition that man makes history is true, the proposition that history makes man is also true. That does not mean to espouse a relativism that says that any culture is as good as any other as Vico and Berlin and Vattimo keep warning their readers, apparently to deaf ears. What did that wise man in Palestine say? Let those who have ears, let them hear. P.S. One of those anti-multiculturalist barbarians within the third Vichian rational cycle of history is Anders Breivik who after murdering 77 people, not only does not think he did anything wrong, but today demanded a medal of honor on his chest for heroically defending his culture, and to be set free. Paradoxically, his happens to be a relativist argument demanding special moral standards for special people of his hilk; i.e., for the barbarian of the intellect who first rationalizes what ought never be rationalized, and then absolutizes his rationalization. The question arises: can one possibly be more confused and misguided than that? To be sure, Vico does not refer to the principles of morality as simply "our own moral statands..." The title, PRINCIPI DI SCIENZA NUOVA invokes the *principles* of morality/authority, which--after Socrates--Vico has noted to be *seemingly* buried in our memory/imagination (whether of the past or of the future)--cf. DE CONSTANTIA PHILOSOPHIAE, Ch. I.1. Most pertinent is the quote from Cicero's DE LEGIBUS with which opens Vico's DE UNO. The principles of morality are to be drawn "from the interiorities of philosophy" (EX INTIMA PHILOSOPHIA)--interiorities that extend all the way to the eternal source of "true religion" (VERA RELIGIO, after Augustine/Varro), or of "the cult of the one and only God, who is comprehended by the mind" (UNIUS DEI, QUI MENTE INTELLIGATUR, CULTUS)--DE CONSTANTIA PHILOSOPHIAE, Ch. IV.1). Such is the case strictly "where the one and only true and truth is God himself, and by the mind, not by sense, do we have conscience of the true" (CUMQUE VERUM UNUM ET VERITAS SIT IPSE DEUS ET MENTE, NON SENSU, VERUM COGNOSCAMUS--ibid.). Note, however, that COGNOSCERE is *to sense* in participation with intellection. In sum: whereas *we* commonly sense God with the mind, *the mind*--not "History" (pace historicists)--intelligizes or comprehends the God of Christianity. Despite the addition of another paragraph reaffirming a wong-headed and misguided distortion of Vico’s philosophy, only confirms for me that whatever the reflections on some original primary sources in the original Italian which I attempted to explore in above posting, were lost to the ears of Mr. Andreacchio who has at times signed himself “Roman Stranger” and seem to like to authoritatively pontificate ex cathedra with a few epigrammatic utterances, wishing to give the impression that lo and behold we have before us a widely recognized authority and expert in Vico scholarship. He cavalierly questions what is in fact widely recognized and acknowledged by the vast majority of Vico experts, that Vico is none other than the precursor and the father of modern historicism. He does this by simply placing a question mark after such a claim. And there lies the rub. One is left with the distinct impression that behind this unsupported authority on Vico there is at work a demigod of sort who was born wise and knowledgeable and dwells in the ethereal air of Mount Olympus rather than in the existential situation within time and space of ordinary men. I say that simply because it has never been clear to me, despite all the appendages and comments and bold lettered words and expressions Mr. Andreacchio has regularly and dutyfully appended to my numerous ruminations on Vico in Ovi magazine (always predictably attacking Vico’s historicism) where his expertise in such a field was acquired and formed? For some strange reason it has always remained a well guarded secret. It seems to have been born ex nihilo from Zeus’ brow. On the other hand my own mentors and teachers on Vico, toward whom I remain grateful, have repeatedly been mentioned. They can be located mostly at Yale University which has a well deserved reputation for Dante and Vico scholarship and where I wrote a Ph.D. dissertation on Vico’s concept of Providence and historicism (1990). The scholarly reputation in the field of those men has never been in question by anybody. They are Professors Gianturco, Bergin, Battistini, De La Terza, Tagliacozzo, Mazzotta, Vattimo, Nelson. Isn’t about time that we learn who Mr. Adreacchio’s teachers have been in the field, the men who made him an expert on Vico by which to challenge authoritatively the overwhelming consensus of most scholars regarding Vico’s historicism at the age and academic time-table at least half of mine and one third of the above mentioned scholars? Or, as mentioned, are we to believe that Mr. Andreacchio was conceived all wise and all knowledgeable from his mother’s womb? The disingenuous answer I once received a disengenuous reply that he cares not for academic pedigrees and degrees, but that is belied by the fact that he is now at Cambridge University as a candidate for a second “final” degree; the first having been acquired at the University of Illinois, whose specialization is also not very clear in my mind as of now. As the caption on top of the comment box proclaims I have gotten this off my chest. Meanwhile I keep waiting for an answer of some sort. I confess that I will be most pleasantly surprised, if it is ever forthcoming. My image of exquisite irony in the dialectic of poetry and philosophy is that of the dying (or dead?) Plato with a copy of Aristophanes' plays in his hand.